Really, Tedd, you should be familiar with systems with dependencies that keep just anything from being possible. You’ve modded games! Also possibly other things that would make you familiar with that sort of thing, but mostly modding games. Obviously. Bit of a zoom in on panel three, because why not, eh? It would be antithetical to the entire feel of EGS for all transformations to come with the risk of accidentally becoming permanent. The potential for enchantments with a “ticking clock” mechanic, however, is another matter entirely, especially if there’s a quirk to them that keeps them from being excessively common (hellooooo, old systems of magic). And yes, accusations that these changes are designed to give me a whole mess of story options that wouldn’t make sense previously are perfectly valid. I figured the nicest example I could give was one in which a person would potentially be stuck being young again, because oh no, youth restored, they have to grow up again, the absolute dreadful horror, obvious sarcasm, etc. I mean, yeah, winding up a kid again isn't ideal, but I needed SOMETHING, darn it, and look! She's still got time on the hourglass dealie! Maybe she'll find a stepladder or something! At one point, the stakes of severely changing magic included the side effect of storms that would severely damage modern technology around the world. This was cast aside, as it would be something people would reasonably conclude I would never let happen. 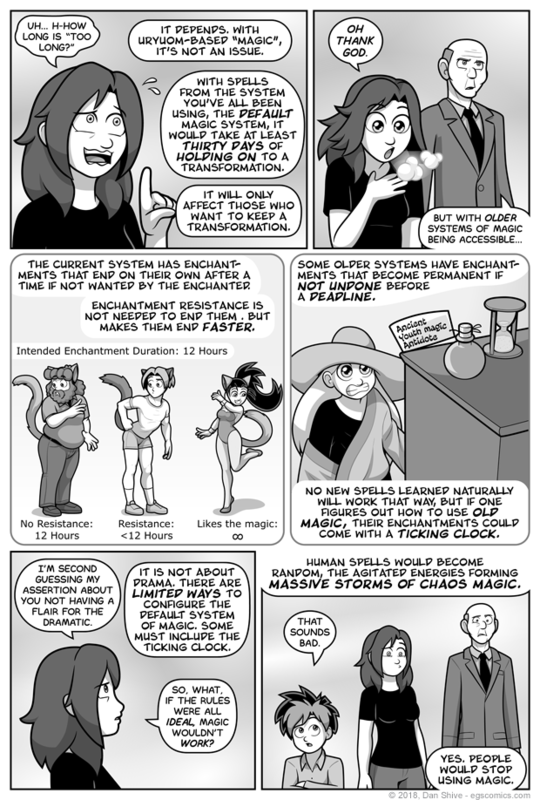 A new system of magic to figure out, maybe, but destroy all of the world’s tech? It would be a bit like James Bond being stuck in a death trap halfway through the movie. It might be interesting to see how he gets out of it, but you know he’s going to do it.